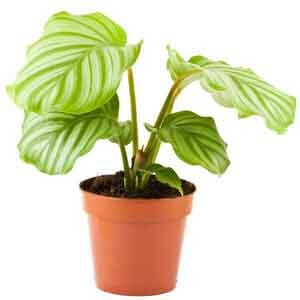 A wonderful foliage plant that offers color and brightness for any room! Its broad leaves are dark green variegated with white on the upper surface and often reddish purple on the undersides. The variegation patterns differ amongst available varieties. All varieties make beautiful companions to finely textured ferns or palms. Perfect for all kinds of containers. Very decorative on a small table or in a hanging basket. Rotate plants often to maintain uniform growth. Keep soil evenly moist. Trim plant if needed to maintain desired size and shape.